Slash – Anastasia – iHeartRadio. 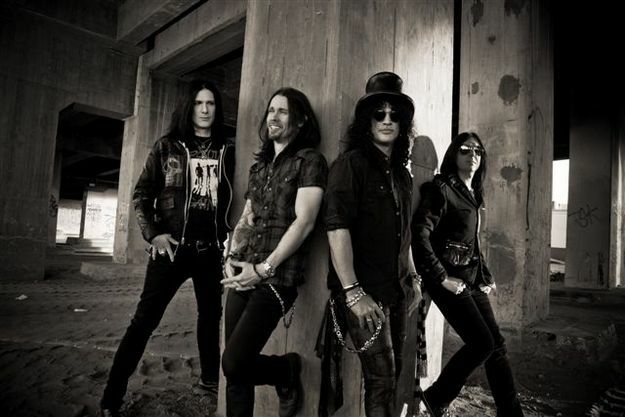 Slash, Myles Kennedy and The Conspirators do it again! iHeartRadio has the US Exclusive for Apocalyptic Love’s Anastasia Live Video Premiere. Todd Kerns was born on the 5th of December 1969 in Smallville, Canada. Todd is a Canadian musician who has worked with several successful Canadian bands most notably Age of Electric where Todd contributed to the band as a guitarist and a vocalist. Todd’s brother bassist John Kerns was part of the band including another pair of brothers namely Kurt and Ryan Dahle. Age of Electric was one of the most commercially successful Canadian rock bands in the mid-90s. Their commercial breakthrough came with the release of their debut album titled Ugly which was released in 1993, after that they released their second album called The Age of Electric in 1995. The band regrouped in 1997 to release their third album titled Make A Pest A Pet, the album spawned the radio rock hit “Remote Control” which peaked at Number 9 on Canada’s Singles Chart. Although the album was a hit, tensions within the band led to a breakup after a 1998 tour as the opening act for Our Lady Peace. Todd, his brother John along with their youngest sibling Ryan Kerns and Scott McCargar formed Static in Stereo in 1999. Static in Stereo released a self-titled album in 2002 which documented the challenges that the band members experienced after the breakup of Age of Electric. Each song on the album is written in quasi-diary form and each song chronicles the obstacles the band faced after Age of Electric. The album pays homage to the bands that inspired Static in Stereo such as The Rolling Stones, The Clash and Kiss. The different musical style of each band member is present throughout the entire album. Heavy guitar driven tracks and heavy bass dominate on the album. In 2004 Todd released a solo album called GO TIME which is a collection of original songs influenced by artists that is close to Todd’s heart for example T-Rex, Bowie, MC5 and The Stooges. In the past up until now Todd has delved into another passion of his which is production and songwriting with other musicians. Todd has appeared on albums by artists like The Matthew Good Band, Bif Naked and The Neverending White Lights. In 2007 production projects brought Todd to Las Vegas where he formed Sin City Sinners with former Faster Pussycat guitarist Brent Muscat which would eventually become Vegas’ favourite rock band. Sin City Sinners perform self-penned originals and rock ‘n roll covers throughout Las Vegas, Nevada. The band is composed of Brent Muscat, Todd Kerns, Zachary Throne and Rob Cournoyer. Sin City Sinners regularly feature appearances by many notable musicians, actors. comedians and other entertainers. In 2009 Sin City Sinners finally decided to put some of their self-penned originals and covers on their debut album. The album “Exile on Fremont Street” was produced by Todd Kerns and released in early 2010. The album was met with rave reviews. 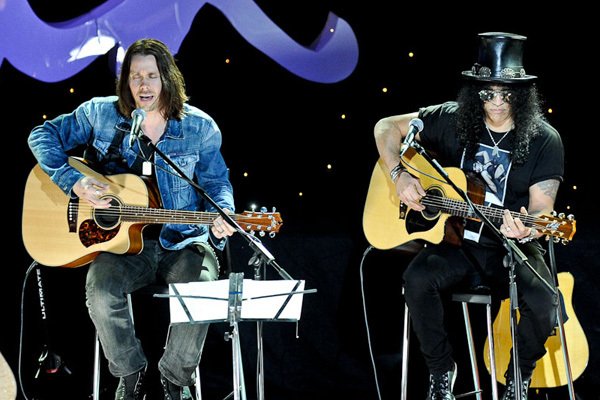 In mid 2010 Todd was offered the opportunity of a lifetime, to go on tour with the one and only Slash. Todd joined Slash on his solo album promotion tour and still fronted Sin City Sinners when he was in Las Vegas. On the 17th of December 2010 the Sin City Sinners released an acoustic album titled “Broken Record” and on November 25th the band released a holiday album called “A Sinners Christmas”. 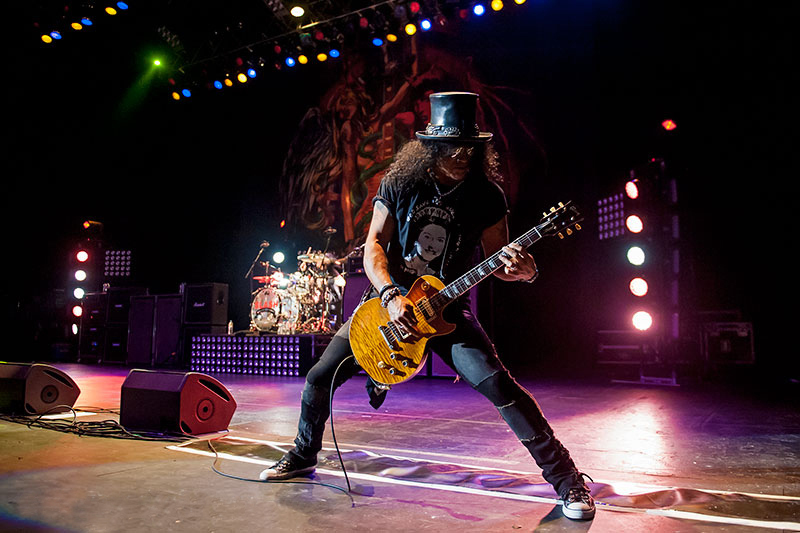 You will probably be forgiven for being transfixed by Slash and Myles during their live performances, but Todd can hold his own among these talented musicians. He even sang a 1/4 of their set when Myles Kennedy was ill with bronchitis. His current bandmates tease him, because he is so handsome. My impression of Todd when I see him perform is that he was born to be a musician and that he is extremely passionate about his career in music. He is a fun-loving guy and he enjoys music as a listener as well. He has found some really unique ways of connecting with his audience, by answering their questions on his website and through his blog he shares interesting stories that his fans can appreciate. I love the way he mimics the words of a song while Myles is singing. To me it just shows how humble he is and that he enjoys the music just as much as the audience does. I love his version of Doctor Alibi he sings during their live shows. Todd has proven himself time and again, I hope we can look forward to many more years of music with this talented musician. 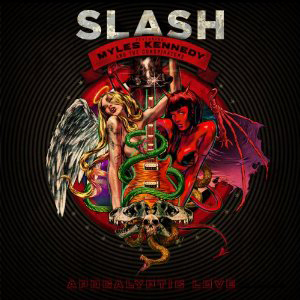 Last week I accidentally discovered the new single from SLASH featuring Myles Kennedy and the Conspirators. The SLASH/Myles Kennedy fever got hold of me and I watched the music video 3 times, thats how awesome the song is. I will be very interested in purchasing Apocalyptic Love (title of their new album) once its becomes available in South Africa. Photo taken from SLASH’s official Facebook Page.